Sofia (Bulgarie: София, pronounced [ˈsɔfija] ( listen)) is the caipital an lairgest ceety o Bulgarie an the 47t lairgest ceety bi population in the European Union wi 1.3 million fowk. 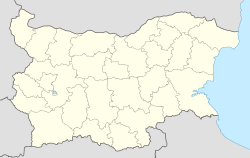 It is locatit in wastren Bulgarie, at the fuit o Munt Vitosha an is ranked as a Beta warld ceety. Prehistoric settlements wur excavatit in the centre o the present ceety, near the ryal palace, as well as in ooter districts such as Slatina an Obelya. The well-preserved toun walls (especially their substructures) frae antiquity date back afore the 7t century BC, when Thracians establisht their ceety next tae the maist important an heichlie respectit mineral sprung, still functionin the day. Sofia haes haed several names in the different periods o its existence, an remnants frae the ceety's past can still be seen the day alangside modren landmarks. Sofia wis first mentioned in the sources as Serdica in relation tae Marcus Licinius Crassus' campaigns in 59 BC. The name Serdica or Sardica (Σερδική, Σαρδική) wis popular in Laitin, Auncient Greek an Byzantine Greek sources frae Antiquity an the Middle Ages; it wis relatit tae the local Celtic tribe o the Serdi. The name wis last uised in the 19t century in a Bulgarie text, Service an hagiografie o Saunt George the New o Sofia: ВЪ САРДАКІИ. Anither o Sofia's names, Triaditsa (Τριάδιτζα), wis mentioned in Greek medieval sources. The Bulgarian name Sredets (СРѢДЄЦЪ), which is relatit tae среда sreda (middle), first appeared in the 11t-century Vision o Daniel an wis widely uised in the Middle Ages. The current name Sofia wis first uised in the 14t-century Vitosha Chairter o Bulgarian tsar Ivan Shishman or in a Ragusan merchant's notes o 1376; it refers tae the famous Hagia Sophia, an auncient kirk in the ceety namit efter the Christian concept o the Holy Wisdom. Although Sredets remained in uise till the late 18t century, Sofia gradually owercame the Slavic name in popularity. Durin the Ottoman rule it wis cawed Sofya bi the Turkish population. The ceety's name is pronooncit bi Bulgaries wi a stress on the 'o', in contrast wi the tendency o foreigners tae place the stress on 'i'. Interestingly, the female given name "Sofia" is pronooncit bi Bulgaries wi a stress on the 'i'. ↑ "Sofia Trough Centuries". Sofia Municipality. Retrieved 2009-10-16. ↑ "Таблица на населението по постоянен и настоящ адрес". ГД "Гражданска Регистрация и Административно Обслужване". Retrieved 2008-03-10. ↑ The Cambridge Ancient History, Volume 3, Part 2: The Assyrian and Babylonian Empires and Other States of the Near East, from the Eighth to the Sixth Centuries BC by John Boardman, I. E. S. Edwards, E. Sollberger, and N. G. L. Hammond, ISBN 0-521-22717-8, 1992, page 600: "In the place of the vanished Treres and Tilataei we find the Serdi for whom there is no evidence before the first century bc.It has for long being supposed on convincing linguistic and archeological grounds that this tribe was of Celtic origin"
↑ "Twinning Cities: International Relations" (PDF). Municipality of Tirana. www.tirana.gov.al. Retrieved 2009-06-23. Wikimedia Commons haes media relatit tae Sofia. This Balkans-relatit airticle is a stub. Ye can help Wikipaedia bi expandin it. This ceity-relatit airticle is a stub. Ye can help Wikipaedia bi expandin it. This page wis last eeditit on 10 Mairch 2018, at 19:22.